For the first time in years, I feel like Oscar night was a great time for menswear! Even though no one dared to wear anything bold there was a real variety in the range of tuxedos the attendees chose to wear. Eddie Redmayne wore a stunningly fitted single-breasted one-button Alexander McQueen tux with peak silk faille rever, gold barbed cufflinks and, my favourite, black velvet skull slippers. The shoes really elevate the look and I am so glad that Eddie stays masculine and elegant but daring. Bradley Cooper wore a custom made Tom Ford 3-piece tuxedo. The fit was spotless – slightly cropped trousers, perfect sleeve length with just enough cuff showing. The best thing about Bradley's look was the slicked-back hair and scruffy stubbled, which balanced each other out and were a good change from Cooper's usual ungroomed self. The surprise of the night was Chris Pine, who wore a double-chested number by Ermenegildo Zegna su misura and Salvatore Ferragamo shoes. He knows how to wear a suit and always looks confident and sharp. I loved the classic cut of the suit, the perfectly tied bowtie and his stubble, which added an interesting touch to the look. Daniel Day-Lewis, who took home his 3rd Oscar, wore a custom made Domenico Vacca tuxedo. As I've said many times before I love a midnight blue tux and, even though I like it more with a broad split satin lapel, I loved the modern touch the shawl collar gave to Day-Lewis. I wasn't crazy about his shoes but any man who can rock untidy grey hair on the red carpet deserves my respect. 1. The music number by Joseph Gordon-Levitt, Seth MacFarlane and Daniel Radcliffe. 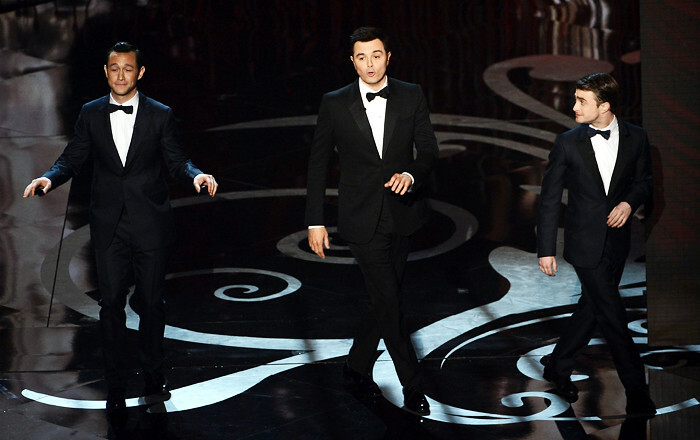 This is exactly what Oscar entertainment should always be like – cool dudes in pristine tuxedos singing Frank Sinatra. Gordon-Levitt and McFarlane both went for Gucci tuxedos, while Radcliffe went for a Prada number – and a mighty chic one, I might add. 2. George Clooney's grooming. The actor, who stays faithful to Armani for his red carpet attire, looked great with his grey beard and slight quiff. 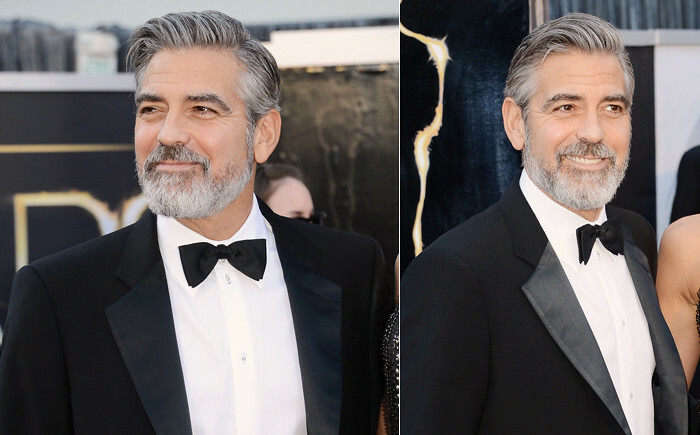 It's a lot of work to keep a beard well groomed but Clooney's got it all right – perfect length, trimmed around the edges and perfectly combed. His hair also looked fantastic, styled but slightly casual.